Learn the latest news and announcements related to our research, faculty, students and alumni, recent highlights in the media, and upcoming events. Stay connected with the Faculty of Education on Facebook, Twitter, and YouTube. The Canadian Society for the Study of Education Annual Conference will be hosted in conjunction with Congress 2019 from June 1 to 5. The Congress for the Humanities and Social Sciences will be held from June 1-7 2019 at the University of British Columbia. The CSSE Annual Conference is held in conjunction with the Congress of the Humanities and Social Sciences, and will be from June 1-5. This bilingual conference provides an opportunity for discussion of educational issues among practitioners and educational scholars from across the nation. In March a new School of Kinesiology banner was mounted on the southwest corner of the War Memorial Gym alongside the Thunderbird athletes’ banners. In March, the School of Kinesiology mounted a new banner outside War Memorial Gymnasium, on the south-west corner of the building. 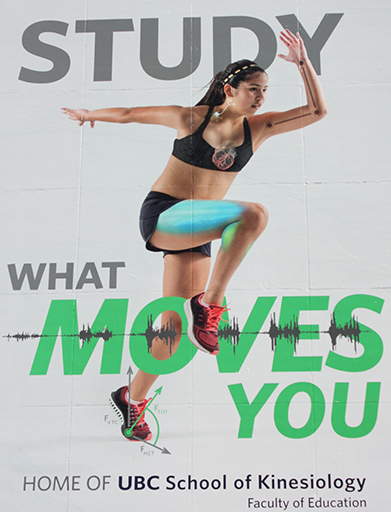 The banner features Scarlett Sparrow-Felix, a young athlete from the Musqueam community. It celebrates the heritage of the School of Kinesiology, and the Department of Athletics and Recreation housed within the War Memorial Gym. The banner is an acknowledgement that UBC stands on ancestral and unceded territory of the Musqueam people, and Scarlett’s family history. It also symbolizes the future and the recognition of history, people and place, and the important role the School of Kinesiology, and Athletics and Recreation play in the evolution of the university. The banner image represents elements of the field of kinesiology, with anatomical, physiological and biomechanical design features superimposed on the photograph of Scarlett. Check it out the next time you are walking by the War Memorial Gym. The National Forum on Wellness in Post-Secondary Education 2019 is being hosted at the University of British Columbia. The National Forum on Wellness in Post-Secondary Education 2019 is being hosted at the University of British Columbia. We’re excited to continue the dialogue that started at last year’s forum and build on the National momentum for supporting wellness in post-secondary education. Werklund School of Education and Ever Active Schools, in partnership with the University of British Columbia and the University of British Columbia, Okanagan Campus are inviting you to save the following dates: Thursday, October 17th, and Friday, October 18th, 2019 for this year’s Forum. Please share these dates with any colleagues, and students, that you may have that may be interested in this year’s Forum. Three-month fellowship opportunity to Durham University's Institute of Advanced Studies to collaborate with Durham affiliated researchers. Contact with a Durham scholar must be made by 24 May 2019. Also, applicants must allow sufficient time to make contact with a potential Reviewer to in turn allow them requisite time to complete the review and to return it directly to the IAS by the 07 June deadline. The IAS is a prestigious, ideas-based Institute with global reach. The IAS brings together world-leading researchers from all disciplines to work with Durham colleagues on collaborative projects of major intellectual, scientific, political and practical significance. At least twenty visiting IAS Fellows will come to Durham each year to work with its scholars to spark new investigations, set tomorrow’s agenda and participate in a varied programme of activities. Each year, the Institute supports four ambitious interdisciplinary projects tackling major research questions. It is advantageous if the interests and proposed activities of applicants complement the 2020/21 research projects sponsored by the IAS (see: www.dur.ac.uk/ias/themes/202021projects). Applicants can, therefore, apply to join a project team during the Fellowship period (see pro forma at the end). However, fellowship applicants can also apply to join Durham colleagues in other collaborative projects, to develop ground-breaking ideas, explore interdisciplinary synergies and develop new programmes of research. It is a condition of the Fellowship that a research collaboration is undertaken. An IAS Fellowship provides recipients with the opportunity to develop their ideas and collaborations in a thriving community of researchers, and through engagement with the University’s Departments and Colleges. For the duration of their stay, all Fellows will be provided office space (single or multiple occupancies). In addition, all Fellows will be welcomed into a Durham College where they will be offered accommodation (in a one bedroom flat, or similar), and membership of the College’s Senior Common Room. The IAS will cover the costs associated with the Fellow travelling to Durham from their home institution (one return fare – economy class) and will provide all Fellows with an honorarium (£3,000 for three months). Limited funds exist for teaching buy-outs or contribution to the loss of income. Academics who will not be on research leave/sabbatical leave whilst taking up a Fellowship in Durham are eligible to apply for teaching buy-out costs of up to £8,000 (for the three month period or pro rata for shorter stays). Alternatively, individuals who will experience a loss of income as a result of accepting an IAS Fellowship are eligible to apply for a contribution towards their salary/earnings of the same amount (up to £8,000). Produce an ‘End of Fellowship’ report of no more than 1,000 words detailing their activities and achievements during their time at the IAS. David Roche and James Sanders talk with CTV Morning Live about Wingspan Disability Arts Artfully Performing Inclusion & Accessibility. David Roche and James Sanders talk with CTV Morning Live hosts Keri Adams and Jason Pires about Wingspan Disability Arts Artfully Performing Inclusion & Accessibility in and out of Schools. 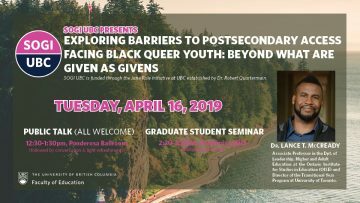 You are invited to join us for a public talk by Dr. Lance McCready about exploring barriers to Postsecondary access facing Black queer youth. Little to no research examines the barriers Black queer youth face accessing postsecondary education, and how these barriers are both similar and different from Black youth who identify as heterosexual and/or cisgender. 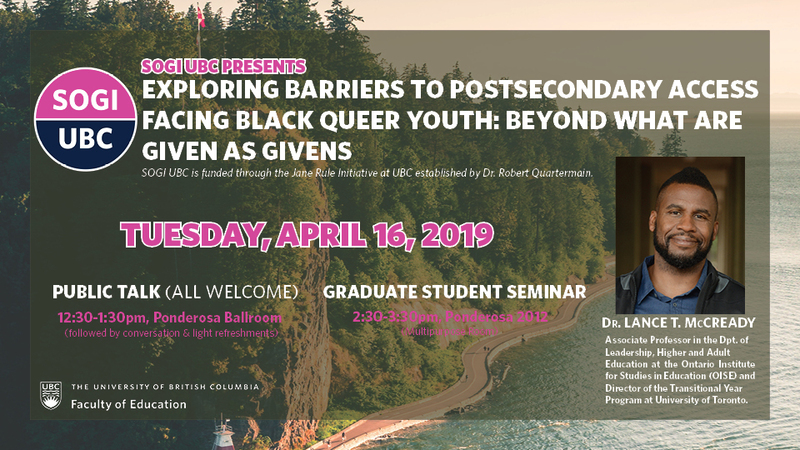 The absence of sexual and gender minority youth in scholarly literature on racialized youths’ postsecondary access works against anti-oppressive approaches to policymaking, research and practice that address multiple social determinants of health and their intersections. In this presentation, Dr. McCready reports on the findings of interviews and focus groups with Black queer youth in Toronto, focusing on the experiences of queer and trans identifying young Black women. Dr. McCready argues that Black queer youth narratives are pedagogical, in the sense that they can help educators and policymakers move “beyond what are given as givens” (Stack, 1997) to consider ways in which individuals, schools and community organizations can better support racialized sexual and gender minority youth access postsecondary education (PSE) as part of their plans for lifelong learning and employment. Lance T. McCready, Ph.D. is an Associate Professor in the Department of Leadership, Higher and Adult Education at the Ontario Institute for Studies in Education and Director of the Transitional Year Program at University of Toronto. Dr. McCready’s research program is concerned with the education, health and well-being of urban youth. His dissertation and subsequent publications focused on “making space” for diverse masculinities in urban education and how the experiences of gay and gender non-conforming Black male students reframe the troubles Black male students face in urban high schools. His most recent research focuses on the educational trajectories of Black sexual and gender minority (SGM) youth and access to postsecondary education. Conceptually, he is interested in the ways Black feminist theory (intersectionality), queer of color analysis and social determinants of health frameworks can be mobilized to develop more effective programs that promote achievement, access, engagement and well-being. Dr. McCready earned his M.A. and Ph.D. in Social and Cultural Studies in Education from the University of California, Berkeley with Designated Emphasis in Women, Gender and Sexuality Studies. 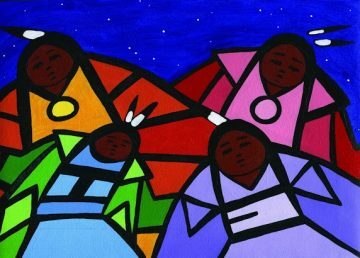 Faculty of Education at the U of A, we invite you to participate in Kihkipiw (sitting with the sacred), a symposium for Indigenous teacher education. On behalf of the Aboriginal Teacher Education Program (ATEP) and the Faculty of Education at the University of Alberta, we invite you to participate in Kihkipiw (sitting with the sacred), a symposium for Indigenous teacher education programs across the country. Through collaborative dialogue and engagement with and in local Indigenous communities, this symposium presents an important opportunity to reflect on the past, consider the present, and imagine the future of Indigenous teacher education in Canada. We hope you are able to join us in ᐊᒥᐢᑿᒌᐚᐢᑲᐦᐃᑲᐣ (Amiskwacîwâskahikan) Treaty 6, Edmonton. There is a reduced registration rate for students, and Elders. Look for regular updates and accommodation information on this Symposium website. The 2019 Faculty of Education Internal Research Funding Competitions are due no later than 4:00 p.m. on April 30th. The 2019 Faculty of Education Internal Research Funding Competitions are due to research.educ@ubc.ca no later than 4:00 p.m. on April 30th. SSHRC Explore Grant (formerly HSS Seed Grant): Up to $7,000 to support early stage research activities that will lead to the development of external research funding applications. John and Doris Andrews Research and Development Award: Up to $12,000 to support educational research and development projects that have an impact on the community and make a contribution to society. The research component must have a direct impact on the community and increase knowledge and understanding of Canadian education. The development component must be conducted in collaboration with a community educational partner. Jacqueline Farquhar Endowment for Children’s Mental Health: $12,000 is available to support projects that translate completed research into accessible forms that community stakeholders and educators can utilize, disseminate and take into the classroom and/or community with a goal of impacting practice. This award is designed to support practical uses for completed research (e.g., the production of a brochure, books, workshops, instructional materials, web sites, etc. ), with a clear potential to impact and increase the awareness of issues relating to children’s mental health. Terms and Application forms are available on the website. For further details and/or questions, please contact Robert Olaj in the Office of Research. Faculty of Education Insight Grants Bootcamp for Faculty members applying for SSHRC Insight Grants in October. Are you interested in applying to SSHRC’s Insight Grants program this October? If so consider joining the Faculty of Education Insight Grants Bootcamp on Wednesday, June 12. Offered in partnership with UBC SPARC and building on the success of SPARC’s Insight Development Grants Bootcamp in 2017 (in which two of our faculty participated and were subsequently successful with their IDG applications), this full day, hands-on workshop will provide applicants a focused opportunity to develop their IG proposal ideas with their peers. Participants will work on key Insight Grant application modules (Summary, KMP, Expected Outcomes Summary and Budget) following a brief presentation on each. Examples of modules from successful applications will be discussed and the day will conclude with a peer editing session of key modules in small groups. Participants must bring a laptop to the session and printing services will be available. Please note, if you have a written draft of your proposal idea please bring it with you, however, applicants are not required to bring proposal drafts to the session. A light lunch and refreshments will be served. Please RSVP to Robert Olaj in the ORE. Registration is open for the CACS 2019 Pre-Conference: The Many Faces of Love: Celebrating the Lifework of Carl Leggo. Where: Ponderosa Commons, Ballroom, 6445 University Boulevard. Registration is open for the CACS 2019 Pre-Conference: The Many Faces of Love: Celebrating the Lifework of Carl Leggo. This will be a day of celebration and remembrance through creativity: poetry, performance, and short papers, as well as visual displays. The plenary-style program will take place between 8:30am and 4:30pm on June 1st, 2019 in the Ballroom of Ponderosa Commons. The fee is Regular $50; and Student/Retired/Unwaged $25. Register by April 26th at bit.ly/2G94d0I. For information please email cacspreconference@gmail.com. Dr. Carl Leggo recently passed away. To celebrate his many commitments to interdisciplinarity and arts-based inquiry, colleagues and friends are creating a new graduate scholarship in his memory. To find out more, please visit memorial.support.ubc.ca/carl-leggo.